Special and intelligent home-taped pop from California's prolific and inspired Spencer Owen. "His songs have a richness that envelops you immediately like a room, rather than wall, of sound." All sounds made/played by Spencer. --- Dreams, specific ones; living in the united states; dealing with 'depression'; and the human body as it relates to time, personal identity and experience. Written and directed by Spencer Owen. "Although Owen lists a diverse range of musical influences such as Elvis Costello, Laurie Anderson, Stephin Merritt of the Magnetic Fields, They Might Be Giants, and even the Boredoms, his music is self-referential more than anything else. The songs produce an immediate sensation of pop familiarity, yet cannot easily be contextualized within any genre of music. At once, Owen upholds and subverts an entire tradition of formula in American popular music." --Noel Vietor, City On A Hill. "Making pop songs is like handiwork - you are nailing pieces of music together, hammering away and you keep hitting your finger over and over again and you're thinking, -Damn it, I just want to finish this bird-house because I know it's going to be beautiful and I'm going to get to watch my bird in it all the time.-"
This is a great self-produced/released masterpiece. Every song speaks for itself, and keeps the listener coming back for more. Catchy, unconventional, lo-fi pop at its best! 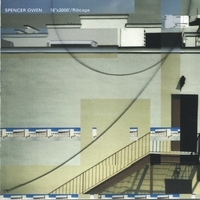 this album by Spencer Owen has got sand. I listened to this album, then I listened to it again. This same pattern continued for a number of days. The first five or six songs especially pack a great deal of gusto, which should pleasantly satisfy most fans of lo fi rock. Man, this is probably Spencer's hottest project from start to finish! That is saying something too, considering he has recorded probably 4000 songs in his day! I love this record so much, I listen to The Method over and over and over and over and over again... MORE PLEASE!